Fulham’s remarkable start to 2018 is put to the test again on Tuesday as Sheffield United visit Craven Cottage. Despite many writing them off, The Blades still refuse to budge in their assault of achieving back-to-back promotions. Our man George Singer runs the rule over our visitors from South Yorkshire. Fulhamish Tip: Ryan Sessegnon to score another Blades hat-trick is 75/1 with Grosvenor Casino. Hello and welcome to another edition of Before the Whistle! 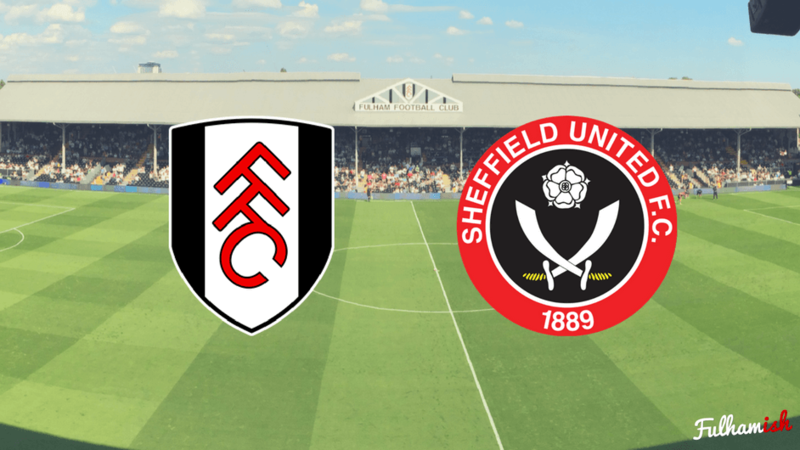 After a run of incredible results against the top teams in the league, the next side to block the path of this imperious Fulham side are Sheffield United. What should we look out for from the Blades, as they aim to upset the form books and get a result at the Cottage? What an incredible game this was! Not only were we treated to a 9 goal thriller, but this was surely one of the pivotal moments in the season for the Whites. We saw wonderkid Sess come of age, with a hattrick on his 50th appearance for the Whites, and watched this Fulham side finally click into into one serious about promotion. Putting 5 past Sheffield United, who at the time were flying high in second, showed us that we could battle with the top teams in the league and come away victorious. We’ve been dominating all in our path ever since. After going behind to an early Leon Clarke goal, Fulham’s attack combined in a way we hadn’t seen so far this season. Before you knew it, Fulham had moved into a 5-2 lead – which only the most optimistic of Whites fans could have predicted. Sheyi Ojo was marking a strong performance with a couple of goals, however the pick of the goals was arguably Sess’s third – controlling an ‘Ollywood crossfield kick and shooting across the keeper with a strong left foot finish. In true Fulhamish fashion, the Whites couldn’t resist teasing their travelling fans, almost snatching a draw from the jaws of victory. 2 more shots went past a shaky Button, including a third for Leon Clarke, to move United just 1 goal away from an unlikely point. However, this comeback was left a bit too late and it was Fulham who travelled back South with the win. Sheffield United have consistently used a back 3 throughout the season, most commonly in a 3-5-2. They don’t have the largest squad in the league, and have therefore largely stuck with the same core of players in each game. With no major injuries, or suspensions, it’s unlikely we’ll see something majorly different to the above side. However, as we’ve seen with Bristol City (who have an equally small squad), teams who don’t rotate often struggle to string together results in the condensed winter schedule. Since December, Sheffield United have won just 4 times in 14 matches. Whilst they’ve played some tough opponents recently, they’ve clearly struggled to recreate their early form which saw them rocket into the automatic places. Normally I pick one player to look out for from the opposition. However, this week, I’m unable to split the impressive striking pair of Leon Clarke and Billy Sharp. Therefore, I’ll choose both! The 2 front men have the lions share of chances for the blades, with the pair averaging a combined 1 xG per 90mins. Of the two, Billy Sharp has the better recent form, with 5 goals in his last 5 games. However, they’re both equally dangerous, and we will need to prepare well to keep them out. Sheffield United are a team that are deadly from balls into the box. Whether from well worked set piece routines, or crossing from from out wide, they are a team that stick to what they’re good at. This is where Sharp and Clarke thrive. Whilst they’re not the tallest players in the world, they do have the invaluable quality of being in the right place at the right time to finish these chances off. After a strong start to the season, made extra impressive considering this was their first season back in the Championship, the Blades are now struggling to recreate the early results which turned them into promotion contenders. The Blades front 2 will finish any opportunity they get their hands on, so holding on to possession and protecting the wide areas of the pitch will be key. Whilst the condensed schedule is tough on the players, I’d be wary of changing the Fulham team too much. Particularly at fullback, we’ll need to be at full strength to protect our wide areas and stop crosses coming in. However, I’m sure Slav will be able to find the right balance of freshness and quality to keep our 8-game winning run at the Cottage going.